So you want to be a web content writer on the WWW (World Wine Web)? 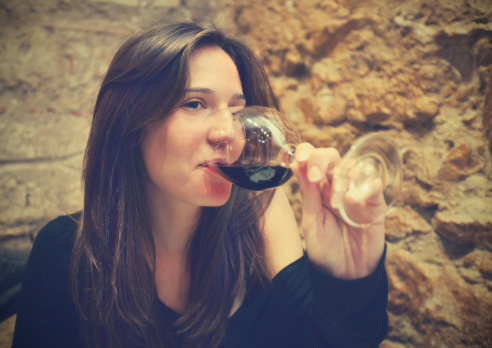 Take it from the woman who began her Wine Spectator, “Last Call” personal essay with “I’m not a wine expert — I just play one on a pay-per-click, start-up website.” You do not have to know everything there is to know about wine to make a splash! Go into it with a light-hearted spirit and a confident, raised glass. Readers do not expect you to know scads about every grape and growing region on the planet. Don’t let words like terroir terrorize you! Have you watched “Somm?” Holy Moldy Botrytis Batman! There is no end to the knowledge base in this industry. So carve out your niche and (wine) press on with your strengths. Is your favorite writing voice quirky and snarky? Run with it! Self-deprecating humor your forte? Work it! If you refuse to spend more than a single dollar digit on a .750 milliliter bottle, crown yourself the Bargain Wine Ruler of the Universe like the upbeat and helpful Reverse Wine Snob. If your writing venue allows, dare to be the authentic, accessible and flawed human you (probably) are. Readers will find it easy to bond with your well-portioned doses of neurosis. Coming across as a dull, cerebral, factoid-filled oenophile will not increase page views. Leap into wine writing with the belief that you know just a teeny bit more about wine than the average person because you enjoy it so much. Make it your mission to offer helpful information and knowledgeable recommendations to those less familiar. Inspire them to feel courageous and empowered! If you need a mentor in embracing this mindset, read Willie Gluckstern’s “The Wine Avenger,” an utterly witty, wacky, wonderfully well-written wine resource published in 1998. When I saw the chapter titled “Oak: The MSG of Wine,” I screamed, “Are you my Daddy?” Gluckstern fancies himself a super hero for the vulnerable and unsuspecting wine slurping masses, pledged to defend them from gouging wine shops, pretentious wine lists and disingenuous wine writers. Join his crusade! Does life get any better than writing about wine while you are drinking wine? Like any other fast moving, constantly evolving industry, you’ll need to be aware of evergreen web content writing versus shorter shelf life topics such as vintage variations. But that’s part of the fun. While you might know the general flavor profile of a Sauvignon Blanc from New Zealand’s Marlborough Region, when the 2015s come out and blow the top off your head, you’ll really have something to write about! Laura W parlayed over 300 consumer wine reviews into a Wine Spectator personal essay followed by a bi-weekly wine column in a small town newspaper. If she could drink wine and never gain weight, she’d probably always be drinkin’.